Acne problems can cause unsightly marks and infections on the surface of skin. The patient may often experience discomfort and embarrassment along with an acne breakout; the scarring that follows an active acne problem can cause further embarrassment and pain, and can lead to the disfigurement of the facial skin. An effective acne treatment system is necessary to deal with the causes of acne, to provide the patient with the relief from discomfort and embarrassment that he or she deserves. The Obagi CLENZIderm M.D.® System effectively treats acne at its root cause, and is considered to be one of the most efficient acne solutions available nowadays. The Obagi CLENZIderm M.D. System is the only prescription-strength acne treatment containing a patented, solubilized form of 5% benzoyl peroxide (BPO); this solution effectively penetrates deep into the skin and treats acne where it starts. The CLENZIderm M.D. 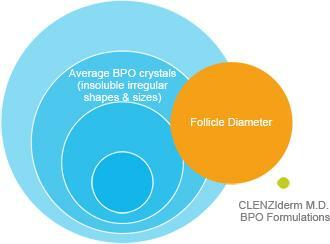 System products are specially formulated to work together to provide optimal results. 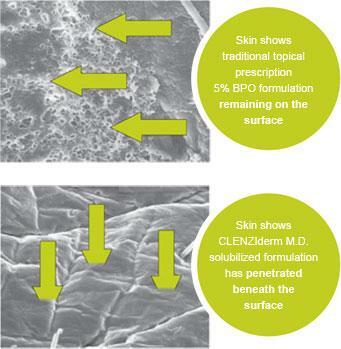 All of the skin care products in the CLENZIderm M.D. System are designed to treat acne problems at the root level, and also prevents the re-occurrence of acne breakouts. See the products in this system, and their descriptions, to know more about their effects on the problems caused by acne. Obagi CLENZIderm M.D. Therapeutic Lotion – This potent The CLENZIderm M.D. System lotion delivers solubilized benzoyl peroxide deep within the follicles where acne starts. The therapeutic lotion quickly clears acne and prevents new breakouts from occurring. Solubilized 5% benzoyl peroxide also significantly decreases acne-causing bacteria. Obagi CLENZIderm M.D. Daily Care Foaming Cleanser – This daily care foaming cleanser effectively removes dirt and excess oil with 2% salicylic acid, leaving the skin feeling clean and refreshed. The 2% Salicylic acid gently washes away dead skin cells to reveal healthier skin underneath, while the menthol cools and calms irritated skin. Obagi CLENZIderm M.D. Daily Care Foaming Cleanser – This daily foaming cleanser removes dirt and excess oil with 2% salicylic acid, leaving skin clean and refreshed. 2% Salicylic acid gently washes away dead skin cells to reveal healthier skin. Menthol cools and calms irritated skin. Obagi CLENZIderm M.D. Pore Therapy – This pore therapy product unclogs pores and clears dead skin cells, as it prepares skin to deeply absorb a liquefied serum that targets acne at its source. 2% Salicylic acid eliminates residue on the skin and minimises blemishes. Obagi CLENZIderm M.D. Daily Care Cream Cleanser – This gentle, non-soap cleanser quickly and effectively removes dirt and excess oil, leaving skin feeling soft and clean. Obagi CLENZIderm M.D. Therapeutic Moisturizer – This non-comedogenic, glycerin-rich moisturizer calms, soothes, and protects skin for enhanced comfort. 1% Dimethicone provides a breathable barrier to soothe and protect skin. 20% Glycerin hydrates to provide a skin barrier against loss of moisture. The use of the products in the Obagi CLENZIderm M.D. System is guaranteed to effectively address the problems associated with acne. A visibly clearer complexion can be expected in as little as two weeks of using the Obagi CLENZIderm M.D. System products.